Taeven Lopatecki with her science presentation at Pender school last month. 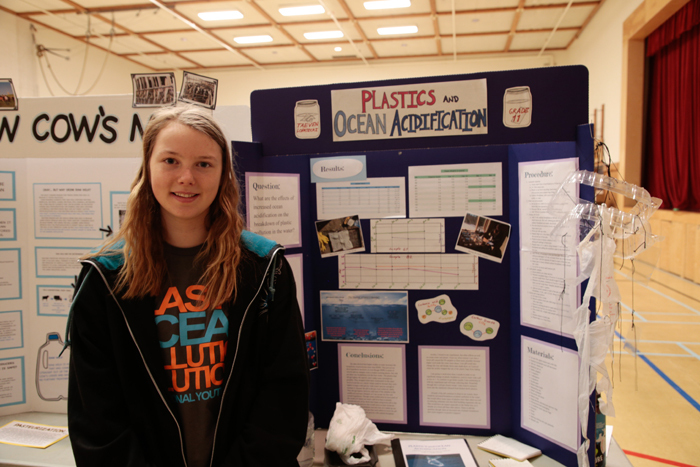 Lopatecki was a winner of the Ocean Networks Award, the Victoria Natural History Award and second-place winner in the senior division at the Vancouver Island Regional Science Fair in Victoria. Pender Island science students took the Vancouver Island Regional Science Fair in Victoria by storm, bringing home 20 different awards, including first place in each age category. The fair was held at the University of Victoria on April 7 and 8. Fifteen young scientists from Pender took part in the event, and around 50 people from the island went to Victoria to see the awards and competition. Though it may seem like something is in the water on Pender that creates skilled scientists, Dunsmuir said their success is more due to the fact that the community has been interested and involved in the science fair since the beginning. The general placement awards were split into four groups: elementary, intermediate, junior and senior. Maraika McConchie took first place in the elementary division, Meredith Boyd for intermediate, Lauren Ohnona in junior and Quynn Stafford in the senior category. Matt Ohnona received an honourable mention for the intermediate category, and Taeven Lopatecki placed second in the senior division. Students also received 11 other awards either for particular attention to a certain field or through sponsorships. Students were also able to make connections with people working in the various sciences. Lauren Ohnona, who advanced to the national competition last year in Ottawa, has been fielding requests from different groups asking about her research. Another student will be visiting the Friday Harbor Ocean Institute for a tour and has been in contact with a PhD candidate at the University of Washington about his research. For more on this story, see the April 17, 2019 issue of the Gulf Islands Driftwood newspaper, or subscribe online.